Former Northern Ireland secretary Mo Mowlam has died, aged 55. She was admitted to hospital following a fall at home and never regained consciousness. She had previously suffered a brain tumour. 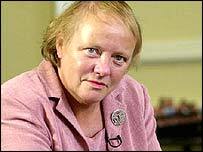 Ms Mowlam, Labour MP for Redcar between 1987-2001, oversaw the talks which led to the 1998 Good Friday Agreement. Tony Blair paid tribute saying Ms Mowlam was one of the shrewdest political minds he had encountered as well as a "remarkable personality". "[She was] great company, utterly irreverent, full of life and fun," Mr Blair said in a statement. "Yet behind that extraordinary front presented to the world was one of the shrewdest political minds I ever encountered. She was a natural politician, could read a situation and analyse and assess it as fast as anyone." Former Labour leader Neil Kinnock said Ms Mowlam would want to be remembered as a "hell of a woman" and described her as "serious, smart, fun and a fighter". If one word summed her up it was "brave", he added. Ms Mowlam had been suffering from ill health for some time. It is understood she suffered balance problems as a result of treatment for her brain tumour - and had failed to regain consciousness after falling and hitting her head at home. She was admitted to King's College Hospital, London, before being moved on 12 August to Pilgrim House Hospice in Canterbury, Kent. She never regained consciousness. It is understood food and water were withdrawn earlier this week, in accordance with her wishes, to allow a natural death. She had asked not to be resuscitated. Paying tribute, Bill Clinton said he and his wife, Senator Hillary Clinton, were "saddened" by news of Ms Mowlam's death, adding that she was an "integral part" of building peace in Northern Ireland. "Her persistence, toughness and good humour were legendary. All of us who worked to support peace in Northern Ireland owe her our gratitude," the ex-US president said. Ex-senator George Mitchell, who chaired the Good Friday Agreement talks, said: "Mo Mowlam made a major contribution to the peace process in Northern Ireland at a crucial time when little progress was being made." Former cabinet minister Clare Short described Ms Mowlam's death as "a very sad day indeed". "Mo's been ill for some time, but it's still such a shock to lose her so young. It feels unfair and wrong. She was so full of life and sparkle. "She was a very beautiful young woman, she survived ill health and helped bring peace to Northern Ireland and now she's gone far too young," Ms Short told BBC News. Conservative leader Michael Howard said Ms Mowlam was held in great affection by many people, adding that her honesty and sense of fun had enriched British national life. Liberal Democrat leader Charles Kennedy said: "She displayed great courage and deep humanity both in her public life in politics and privately coping with her prolonged medical condition." During her time at the Northern Ireland Office Ms Mowlam's enthusiastic, unpretentious attitude appealed to a public who yearned for an end to terrorism in the province and she won standing ovations and media awards in equal measure. She took a major political risk by going inside the Maze prison to talk to prisoners in a bid to restart the peace process. But the failure of the Northern Ireland parties to agree on implementation of the Good Friday agreement and the release of IRA prisoners without the parallel surrender of arms led to calls for her dismissal from Ulster Unionists, who lost confidence in her when she insisted the agreement had not been broken by the IRA. In 1999 she was replaced as Northern Ireland secretary by Peter Mandelson, and became Tony Blair's cabinet "enforcer" after turning down the job of health secretary. She stood down as an MP in 2001. A former key ally of Mr Blair, who helped organise his leadership bid in 1994, she became increasingly disaffected with his premiership and was a vocal opponent of the war in Iraq. Marjorie 'Mo' Mowlam was born in Watford on September 18, 1949 and attended Coundon Court Comprehensive School, in Coventry, before going on to study at Durham University and the University of Iowa. She worked as a lecturer and university administrator before pursuing a career in politics. She married merchant banker Jon Norton, already a father of two, in 1995.